Do you have trouble finding time or resources to take your pet to the groomer? When you find the best dog clippers for thick coats you can trim that mess yourself! Some products, including clippers intended for human hair, simply do not work for dog hair. The hair just folds beneath the blades, or gets horribly tangled in the combs. Unfortunately, attempting to force cutting with inadequate clippers can injure your pet, or at the very least traumatize them and create a fearful grooming process. Wireless dog clippers offer one less thing to worry about when grooming, and that is tangling the cord, or the dog winding around heavy electrical cables. Choosing the right clippers for large dogs with thick coats can be challenging, since there are so many on the market. There are guidelines to follow when making a decision and each feature is important for a specific reason. What Are The Features To Focus On? 1). Sharp blades and strokes per minute(SPM). A higher SPM indicates better cutting power for dogs with thick coats. Most products showcase the SPM in the product description allowing consumers to compare models.For the most part, professional dog grooming clippers have sufficient strokes per minute, however, if you are having trouble finding the SPM in the product details, it was probably omitted strategically because those animal clippers are sub-par. 2). Multiple Speed Settings allows you to adjust the speed for more precise cutting, which is useful around the dog’s ears and face, and to have more control over the grooming process. While many groomers often use one speed setting, a home groomer can benefit from lower settings to prevent a choppy doggie hair-do. 3). Silent motors put dogs at ease much more easily than loud groaning or clacking dog clippers. Dogs are not big fans of loud noises, and the motor alone can cause a high stress environment. When shopping for good dog grooming clippers, keep in mind that a quiet motor is a must-have for fearful or nervous dogs. Most pets abhor loud noises, and before touching your pet with dog hair cutters, the noise alone can send them into a frenzy. Keep the process of grooming your pet as stress-free as possible and reward them with a treat or their favorite toy afterward to make the entire procedure a positive experience! 4). Attachment guide combs are an often overlooked accessory. Many shoppers don’t realize the pet clippers for dogs they had chosen didn’t include these combs. The beauty of guide combs is that hair is consistently cut at the same length without gouging or cutting thick dog hair too short. Any inexperienced and novice pet owner should consider using guide combs. Most top rated dog clippers provide guide combs with their clipper set. Pet trimmers for professionals can include combs, however, some sets do not include them. Pay attention to the “item details” when shopping online. What Material Are The Blades Made With? What Is The Maximum Strokes Per Minute? Are The Blades Self Sharpening? Are They Heavy Duty Dog Clippers With A Quiet Motor? 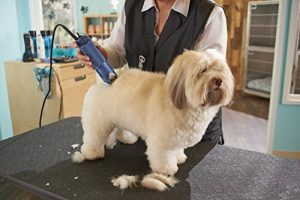 Many of the issues pet owners and groomers face can be alleviated by finding the right electric dog clippers for the job. For example, a set of clippers with blades intended for human hair do not have the cutting ability for soft dog hair. Additionally, an overly cheap pair of clippers may snag and pull your pets haircut a few pieces, and fold the hair beneath the blades. These obstacles can be avoided by simply looking for the right set with the accessories you need. Large dog clippers can be used on even smaller pets, and with the guide combs, delicate areas can be clipped without fear of hurting your best friend. If you are on a budget, the prices for professional dog grooming clippers offer a wide range in pricing. Depending on the features you decide are necessary, there are many budget-friendly options. Especially if you have just one pet that needs a haircut. Keep in mind the features above to avoid annoying and expensive mistakes by going ‘too cheap’, sometimes saving a few dollars on the initial purchase ends up costing you more later. Whether it is because you have to purchase accessories that were not included, or replace the whole dog grooming clipper set because the blades were poor quality. Always get the best that you can afford. More expensive doesn’t always equal better quality. Do your homework to find the best set of clippers for your hard-earned money. Finding the best dog clippers for thick coats doesn’t have to be a chore, consider all of the features and options before deciding on a final product. Keeping a notepad nearby to write down your favorite features and brands will help you narrow down your search. You know your dog better than anyone, and understanding his/her fears, stresses, and hair type will factor into your final decision. Always pay attention to verified customer ratings to ensure a positive experience for you and your pet. It can be daunting to think about grooming your own dog. Yet for people that have high-maintenance breeds, the cost of going to the groomers can become very expensive. We have gone through the many dog clippers for home use on the market to bring you the best dog clippers for thick coats. 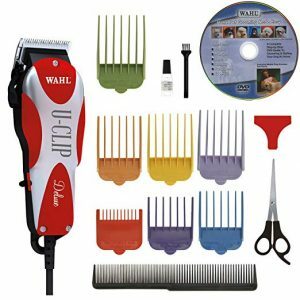 Wahl is a long-standing company that produces clippers for both human and animal needs. Their Professional Animal Deluxe line is the best rated dog grooming clippers for thick coats. • It also includes accessories: scissors, grooming comb, apron. • Cord only available in US model. Oster’s two-speed grooming clipper with two variable speeds is one of the best pet clippers. The two speeds make it easy to switch between precision and body grooms. This corded model will not run out of juice in the middle of grooming. • 2 adjustable speeds give you lots of options. • Blades are cryogenically hardened for long-lasting performance. • The powerful motor runs cooler for longer. • You do not have to worry about running out of power. • It can be pricey. • The guide combs are sold separately. • The cord can get in the way. • It is a heavier model at 1.97 pounds, which can make it difficult to use for long periods of time. Wahl also makes our best cheap dog hair clippers. For those just starting out in dog grooming, it’s a good option for trying it out without spending a lot of money. • Guide combs are color coded to make it easy to find the right one. • The instructional DVD shows step-by-step tips for beginners. • This cordless model is easy to maneuver. • Self-sharpening blades make maintenance easy. • It isn’t powerful enough to take on thick wiry coats, but it is good for thick fur. • Some users found it to overheat quickly. • The guide combs are prone to breaking. While there are better clippers on the market, this set is perfect for people wanting to dip their toes into self-grooming their dogs. WAHL is the king of all-inclusive kits when it comes to grooming. 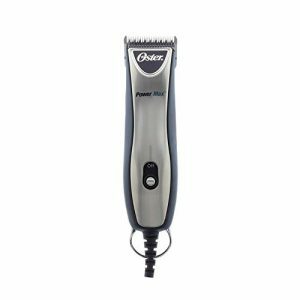 This kit is a good value for the more advanced grooming kits and offers a good middle-of-the-road option for pet hair trimmers. • Run time is up to 2 hours, which is the longest of our reviewed cordless clippers. • Self-sharpening blades also come with color-codes guides of ease of use. • The lithium-ion battery is the most reliable kind of rechargeable battery for a long life. • Everything you may need is included in this kit. 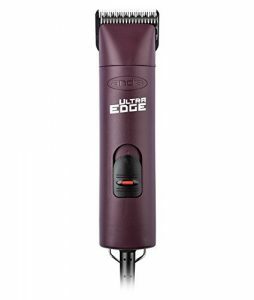 • This clipper does overheat faster than some of the high-end clippers reviewed, though it does perform well even if hot. • While it is on the lower end of the noise spectrum, it is still loud enough to bother sensitive dogs. • These guards are more prone to clogs than some other clippers. You may need to stop several times to clean the guards if you are grooming a large dog. This is a slightly different design than some of the other Andis trimmers, having no fans or vents and a different handle. It also offers a variable speed design, though it is not as powerful as some of the other motors on the market. • The on/off switch locks, preventing it from accidentally getting switched off while in use. • Design has no fans or vents which could get clogged with pet hair. This adds to both the dependability and the low noise of this model. • Chrome-finished blades are corrosion resistant. • Rounded handle is a more comfortable design. • Runs at two variable speeds. • The included blade does not do a great job of cutting through thick matts on thick fur, though it did test well on dogs with medium matted coats and thick coats without matts. Other blades, purchased separately, do a good job of matts on thick-coated dogs. • No combs are included, though they are sold separately. 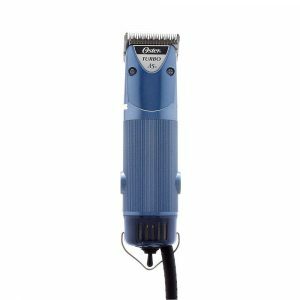 • This clipper is not as powerful as some other trimmers even at its highest setting. Wahl is one of the most trusted manufacturers of pet clippers for thick coats. Their ARCO line is trusted in grooming salons because it is powerful, quiet, and easy to use for long hours. • 5-in-1 adjustable blade makes it easy to switch between different lengths without having to stop to switch out the guards. This is great for dogs that get antsy quickly or dogs with clips of multiple lengths. • 80-minute run time when using the cordless option. It also includes an extra battery so you do not need to wait to charge it once it runs out of power. • Slender ergonomic design is also the lightest at 7.9 ounces. This is great for small or sensitive hands. • The casing is less sturdy than some models, leaving it prone to breaking if repeatedly dropped. If handled with care, it has no issues. • The included plastic combs can be brittle after a lot of use, but metal options can be purchased separately. • The tiny teeth on the blades when not using the guards can make it easy for inexperienced users to nick the skin. To solve, practice with the guards on before taking them off to prevent scrapes. This dog shaver for thick hair is our best option if you are looking to trim a coat to multiple lengths. • 5-in-1 adjustable blade makes it easy to switch between difference lengths quickly. • 90-minute battery life is one of the longest tested. You won’t have to stop grooming in order to charge the battery for most grooms. • It also includes a corded option in case you do run out of battery in the middle of your groom. It charges while you continue grooming. • Prepare for some sticker shock for this clipper. However, if you have a high-maintenance breed it pays for itself in just a few clips. If you need dog clippers for thick coats for these are a good option. • The blades are antimicrobial and more hygienic than other models. This is perfect for multiple dogs or dogs with health problems. • The blade is very sharp and maintains its edge for a long time due to the cryogenic hardening process. • Contoured grips make it very easy to use with a variety of angles. • The included blade is very short; if you want a longer clip you will need to purchase a different blade to use with the included guide combs. • The included guides are not always good at giving a consistent look. With experience, users should be able to remedy this shortcoming. 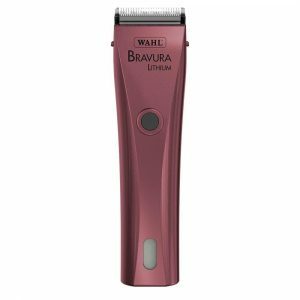 Wahl grooming clipers are consistently rated for all types of coats. • Constant Speed Control automatically adjusts when the coat changes to maintain the same speed throughout. • Lightweight clippers only weigh 12.3 ounces, which makes them a good option for those with sensitive hands or difficulty maneuvering. • 14-foot cord gives a longer reach than some other models. • You do not have to worry about losing battery with this corded model. • Not as fast as some other clippers and can bog down in very thick wiry coats. • Corded models can be more difficult to use. If you have a dog that is very against the idea of getting clipped you may need to get creative in order to get all the angles you need. Electric dog trimmers are good options for sensitive dogs or small dogs with very thick coats since they are both powerful and quiet. For small dogs, our best option is the Andis UltraEdge Super. • Built to last- it stood up to drops and bumps due to the high-impact casing. • 14-foot cord makes it easier to maneuver around the dog. • The blades are designed for easy cleaning. • This was the quietest motor rated. • Corded models can be hard to use on squirmy dogs. • Attached blade is very short; you may have to purchase other blades if the included guides are not what you need. • The casing is not comfortable to use for all hand sizes and some people found it to be to bulky. We can break this problem down into two parts: how to choose the right dog clippers and how to care about dog with thick coats. 1. How to choose the right dog clippers? The right dog clippers will be easy to use, comfortable for you and your dog, and reliable. Reviews are an important way to find out if other people have found the product to fit their needs. We have gone through all the top products and done that work for you. After washing your dog, be sure to dry them completely. Wet fur can tangle, causing mats that can be difficult to remove. If they do tangle, use a slicker brush to gently tease out the fur. You will have to brush your dog often- some dogs need to be brushed out daily! Shopping for dog clippers can be a confusing process. How do you know that you have made the right decision for you and your pet? 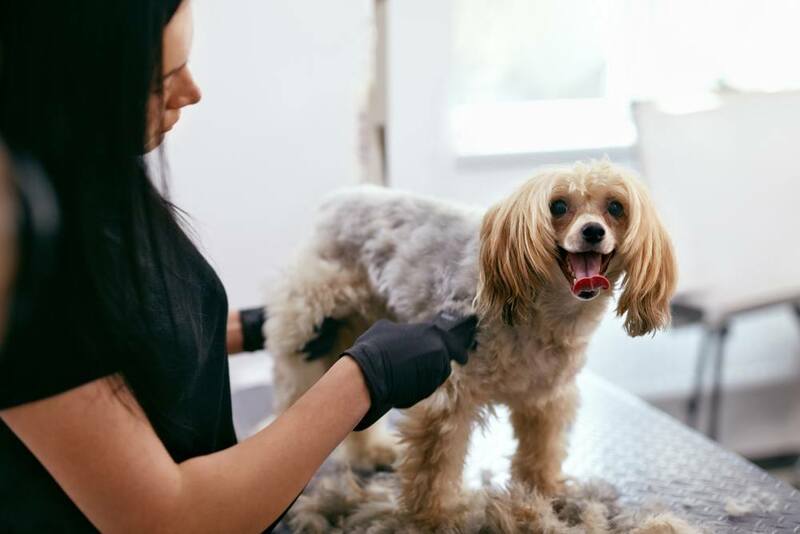 The process is even more confusing if you have a dog with a thick coat, since they have different grooming needs from dogs with other coat types. • Will this clipper be comfortable to hold and use? • Will it glide through the dog’s coat or will it snag and pinch? • Is it cordless for ease of use? • How long will the battery last? • Can it be set to multiple settings for different hairstyles? • Does it come with accessories or do you have to purchase them separately? • How long will it run before it overheats? Conclusion: What are the best clippers for dogs with thick coats? Most people that want to clip their dogs at home are looking for a clipper that will deliver a good cut at a good price. 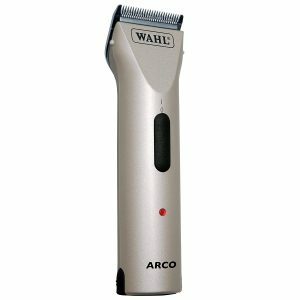 Overall, the best dog clipper for thick coats is the Wahl Professional Animal ARCO. It delivers a consistent performance in a slim, ergonomic package. The extra battery included means that it can trim for a long time while still giving the ease of use of a cordless trimmer. It also includes a good selection of accessories. 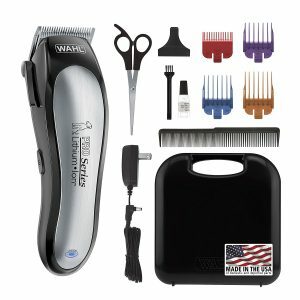 • WAHL Lithium Ion Pro– longest run time of the cordless clippers, but it does not offer multiple speeds. Comes with a nice selection of accessories. 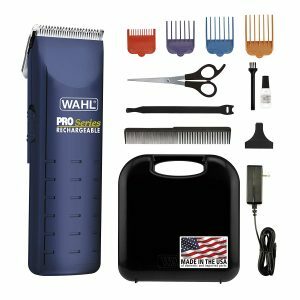 • Wahl Home Pet Pro-Series Complete Pet Clipper Kit- a good introductory kit, it does not offer all of the bells and whistles of the other models and will not hold up to heavy use. Regardless of the model you choose, don’t be afraid to try out the world of home grooming. It’s a great way to both pretty up your pooch and bond with them at the same time. Practice makes perfect.